One more week of great developments in the world of odds and predictions regarding the Eurovision Song Contest 2016. Starting with the betting odds where Russia remaining first but the odds are falling and France although second rises them. Regarding the First Semifinal the odds predict the following qualifiers (and we couldnÃ¢â‚¬â„¢t agree more): Russia, Armenia, Malta, Croatia, The Netherlands, Hungary, Czech Republic, Azerbaijan, Cyprus, Iceland. For the Second Semi Final the odds predict: Ukraine, Australia, Latvia, Serbia, Bulgaria, Poland, Norway, Ireland, Lithuania, Slovenia to qualify to the Final. On iTunes Frans from Sweden shows some activity in Estonia (4), Sweden (6) and Lithuania (21), Amir is popular in Armenia (21), Israel (24), France (127), Ira Losco is 49th in Malta, Sergey Lazarev is 96th in Russia, Barei is 87th in Spain and Agnete 15th in Norway! 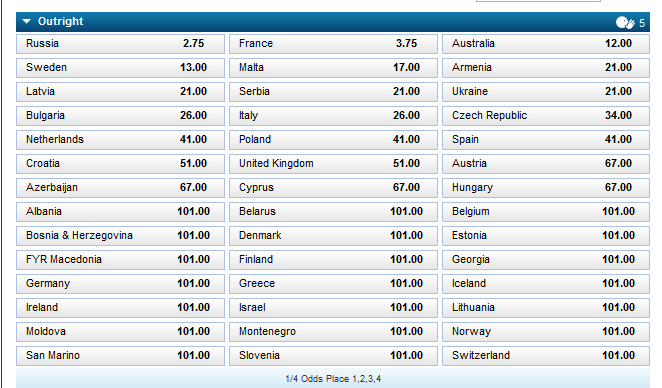 Do you want to bet for Eurovision, earn some cash and you donÃ¢â‚¬â„¢t know how? Well we have the perfect solution for you. Join Betting on Eurovision 2016 and get informed on how things work. On YouTube almost 14 million views for Italy, 7,3 million for Russia, 5,8 million for Poland, 5 million for Germany and 3,9 million for Sweden. In the International OGAE voting 23 clubs have cast their votes and France is now in the lead with 228 points while Russia follows with 206 points. The Top Five ends with Australia, Italy and Bulgaria. Last but not least oikotimes.comÃ¢â‚¬â„¢s Europrediction, 236,072 unique votes so far give lead to Russia, followed by France, Spain, Bulgaria and Croatia. Austria 67.00? Come on! Conchita Wurst win this again Easy Money! nikkidog;n663 wrote: Austria 67.00? Come on! Conchita Wurst win this again Easy Money! Hahaa nice one! I think Cochita can't join this year. I heard few song for finals and I think Slovenia have great chance to win (odds 101). Nice!